Seeing how my colleagues knock out quality manga reviews here and there I thought I should do something like that for the comics crowd. 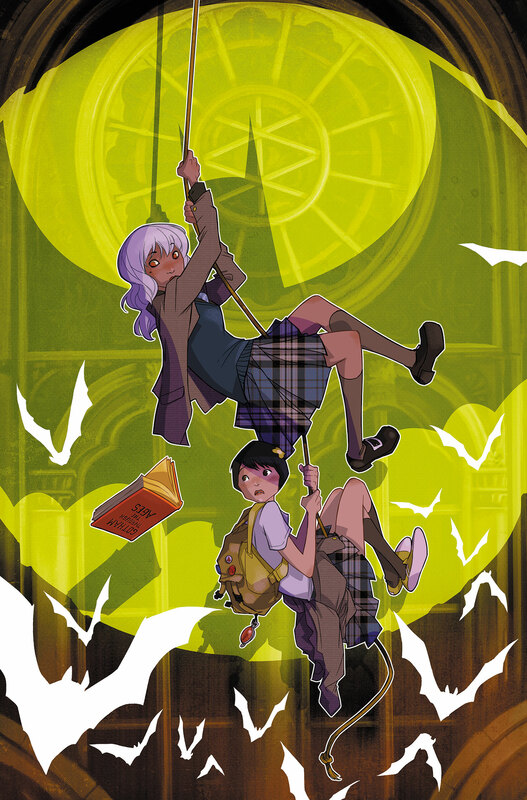 So here is our first tradepaperback review… for Gotham Academy, which is a title I fear is flying under some peoples radar at the moment. 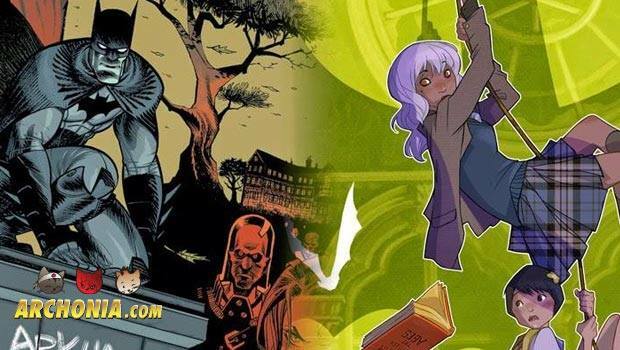 Gotham Academy is a new book by DC Comics, set firmly in the Batman corner of the DC universe and focuses on a prestigious Gotham City school, where only the city’s best and brightest are allowed to enter its halls. 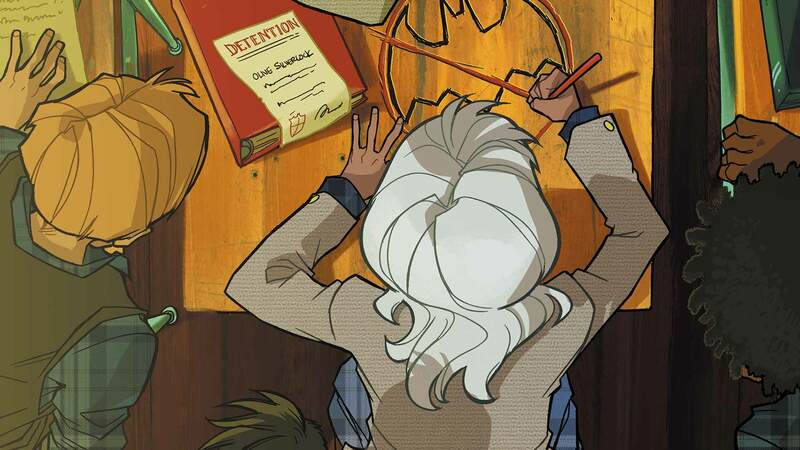 The comic follows Olive Silverlock, a returning student of Gotham Academy, and her gang of friends. Something has happened to Olive over the summer that changed her and gave her a pretty strong anti-Batman stance and we will find out with everybody else in the book what exactly happend as the story progresses. The rest of the cast is comprised out of her ex boyfriend, his little sister Map (who is also kind of Olive’s sideskick) and a mix of other students. I don’t really want to spoil any more about the story, as I found it very twisty and engaging, so I think its better if you only know the setting and initial set up of the book, but let me rattle off a few words (which will get progressively scarier) to hook you: ghost hunting, Batman, chem class, detention, graveyards, occult rituals, madness, homework. Gotham Acadamy is a very different book for DC Comics main publishing line, as it doesn’t really focus on superheroics at all. Imagine a mysterious, Hogwards like school, set in Gotham, funded by Bruce Wayne and a group of kids having adventures in it, with a dash of manga style storytelling. Sounds like an eclectic mixture and it is, but all these different tastes melt really wonderfully together to quite a special comic that feels much more like a creator owned title than part of a huge franchise. The writing by Becky Cloonan (who is mostly known for her amazing art, recently seen in Brian Wood’s Conan for example) and Brenden Fletscher (who also writes the very cool, hip and modern new Batgirl series) is really on point and almost magical. The book really feels like a manga-esque take on those “kids in peril” movies from the 80s, like Goonies, E.T. and many others, but with a lot of Harry Potter influences as well, young love, horror elements and even some guest appearances of Batman characters I won’t spoil here. Even as a stone hearted Batman fan, I really loved the new characters and felt like a teen again. This is what high school would be like in Gotham. But as good as the writing is, another MVP in this book is Karl Kerschl, who brings his cartoony, but still super detailed art style to the book. His characters are expressive and it all has a spooky vibe to it, with almost an animated Disney twist. This is truly one of the coolest pieces of artwork I have seen in a long time. As cute as he draws the main characters, **just wait until you see how badass his Batman looks **(FYI: the one in the header is not out of this book, because I didn’t want to spoil Kerschl’s Batman) and you will get how versatile and talented this guy really is. Great, GREAT stuff! I really did not know what to expect when I started reading Gotham Academy, but now it will be on the top of my read pile every time the new trade comes out. The series stands on its own, so you don’t even need to know much about the current Batman titles to enjoy it and it shows the Batman mythos from a whole different perspective that I found really exciting and special. Seriously… this is one of the best things coming from DC in a long time and I already love most of what they do. Let’s hope this creative team has as much fun creating this book as I had reading it and that they stay on it for quite a while (and that the new student they teased at the end of the trade gets a big role, otherwise I will write angry tweets. Well, I won’t but still). My beloved batbook corner would seem a lot less awesome without Gotham Academy in it. Previous Post : Geekly News Round-up! SDCC 2015 Edition Next Post : Geekly News Round-up!